Mahogany Rush were formed in Montreal, Quebec, in 1970 by Frank Marino, who, while recovering in hospital after a bad drug experience, maintained he was visited by an apparition of Hendrix. Once out of hospital he was able to pick up the guitar and play Hendrix riffs - he claimed he'd never been able to play a guitar before. Their first three albums were extremely derivative of the great man but they weren't condemned as mere copyists, they were applauded for paying tribute to him with such sincerity. They were bigger in the U.S. than their native Canada - indeed they headlined shows with The Chambers Brothers, Graham Central Station and Ted Nugent and The Amboy Dukes in the States. 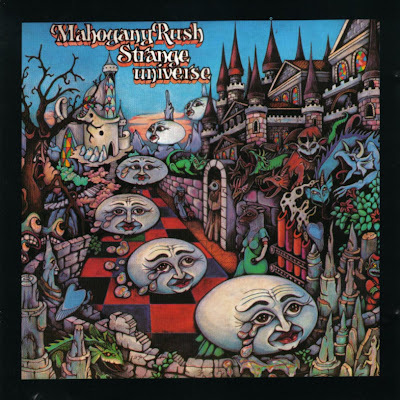 Their third album Strange Universe was their masterpiece - cuts like Tales Of The Spanish Warrior, Land Of 1,000 Nights and the title track were miles beyond all their contemporaries in the heavy rock genre. The record is also technically brilliant and the relatively inexpensive U.S. original is recommended listening. They went on to record well beyond the time frame of this book and their later efforts, which included Mahogany Rush IV (1976) and World Anthem (1977) illustrated Marino developing beyond Hendrix style material and influencing the band's future direction with his own material. This was evidenced by a later name change to Frank Marino and Mahogany Rush and then, in 1980, following Ayoub's departure and the release of What's Next, to simply Frank Marino.